Excessive thirst in cats can be caused by several reasons that include weight loss, diabetes in cats, chronic kidney disease, Hyperthyroidism, Cancer, Cardiac disease, Polydipsia and Polyuria in Cats. Is your cat drinking a lot of water suddenly? 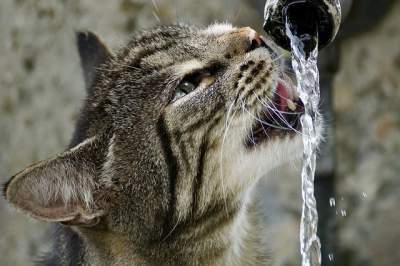 Is your cat drinking a lot of water and meowing? 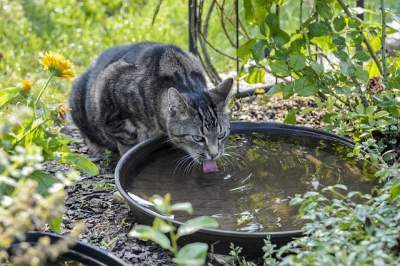 Is your cat drinking a lot of water and losing weight? 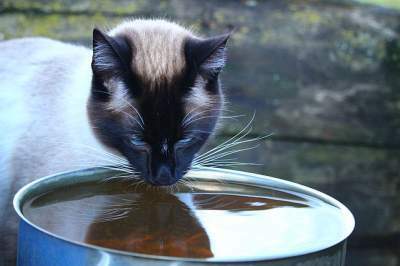 Is your cat drinking lots of water and eating more? Is your cat drinking a lot of water and throwing up? Is your cat drinking a lot of water and diarrhea? By following these simple steps, you can help keep your four-legged, feline companion healthy—potentially for many years! But as a cat owner, you need to be aware of five “silent” killers in cats that make them thirst excessively. By knowing what the most common silent killers are, you can know what clinical signs to look for. With most of these diseases, the sooner the clinical signs are recognized, the sooner your cat will recover once treated. One of the top silent killers of cats that bring about excessive thirst in cats is Chronic Kidney disease (CKD). This sometimes called chronic kidney injury or chronic renal failure. Thankfully, with appropriate management, cats can live with CKD for years (unlike dogs where CKD usually progresses more rapidly). Chronic management may include a low-protein diet, frequent blood work, increasing water intake (e.g., with a water fountain or by feeding a grueled canned food), medications and even fluids under the skin (which many pet guardians do at home, once properly trained). Good news is, treatment for hyperthyroidism works well and includes either a medication (known as methimazole, surgical removal of the thyroid glands (less commonly done), a special prescription diet called y/d® Feline Thyroid Health), or I131 radioiodine therapy. With hyperthyroidism, the sooner you treat it, the less potential side effects or organ damage will occur in your cat. Another costly, cause of excessive thirst in cats is diabetes mellitus (DM). Because most cats are often overweight to obese, they are at even greater risk for DM. Diabetes in cats causes failure to the pancreas and prevents it from secreting enough amounts of insulin (Type I DM) or causes resistance to insulin (Type II DM). Insulin is a natural hormone that drives blood sugar (sugar) into the cells. Once the cells starve for glucose, the body produces more and more glucose, leading to hyperglycemia (i.e., a high blood sugar) and many of the clinical signs seen with DM. DM treatments can be quite expensive, as it requires twice-a-day insulin injections that you have ti give under the skin. It also requires changes in diet (to a high protein, frequent blood glucose monitoring, low carbohydrate diet, and frequent veterinary visits). With chronic management and supportive care, cats can do reasonably well; however, once diabetic complications develop (e.g., diabetic ketoacidosis, hyperglycemic, hyperosmolar syndrome), DM can be life-threatening. Heart disease is every veterinarians and cat owners nightmare. That’s because, while dogs almost always have a loud heart murmur (i.e., one we that can be heard with the stethoscope) indicative of heart disease, cats often do not have a heart murmur present. Once cardiac disease is diagnosed (typically based on physical exam, chest radiographs, Cardiopet® proBNP Test, and an ultrasound of the heart called an “echocardiogram”), treatment may include emergency care for oxygen therapy, diuretics, blood pressure support, and heart medications. Long-term prognosis is poor, as the heart medication does not cure the heart disease; it prevents cardiac disease from getting worse. The exception is when cardiac disease is caused by hyperthyroidism, which often gets better once the hyperthyroidism is treated! Polyuria means an abnormally high urine productions in cats, while polydipsia refers to the animal’s increased level of thirst. Although serious medical consequences are rare, your pet should be evaluated to guarantee that these conditions are not syptoms of a more serious underlying medical conditions. Your vet wil want to rule out or confirm renal failure, or hepatic diseases. Polydipsia and polyuria can affect both cats and dogs, and can be brought on by a variety of factors. The most evident symptoms of these medical conditions are an increase in urination, and excessive thirst in cats causing them to drink more water than usual. Generally, there are no other behavioural changes. The major causes of polyuria and polydipsia includes congenital abnormalities, and those linked with renal failure. Congenital diseases can include a decrease in steroid production by the adrenal glands, diabetes, and some rare psychological disorders. Kidney diseases, meanwhile, can be as a result of congenital defect, or can be linked to increased steroid production, steroid production, increased thyroid hormone levels, and hormonal or electrolyte disorders. The younger and more active a cat is, the more likely it is that it will have intermittent increases in thirst and urination. Your animal doctor will examine your cat to determine the true levels of thirst and urination by measuring water intake and urination output. A baseline of normal fluid levels (hydration) and normal urination will be established for comaprisons, and an evaluation will be performed to make sure that the inceased urination and excessive thirst in cats are not signs of a more serious medical condition. Standard tests will include a complete blood count (CBC), a urinalysis, and X-ray imaging to rule out or confirm any issues with the renal, adrenal, and reproductive systems. Any other symptoms accompanying the increased levels of urination or excessive thirst in cats, even when appearing unrelated, will be taken into consideration during the final diagnosis. As cats and dogs live longer, veterinarians are recording more cases of cancer. The most common type of cancer in cats is gastrointestinal cancer, often due to lymphosarcoma. Once diagnosed, the prognosis for cancer is poor. For this reason, the sooner you notice clinical signs, the sooner diagnosis and treatment may be initiated. Ensure you keep your cat’s weight in check – this will help prevent expensive problems due to obesity such as diabetes down the line. Be a responsible parent and schedule an annual visit with your veterinarian. This is especially important as you can pick up on physical abnormalities sooner. Note that even if your cat is indoors, she still needs an annual exam; you may be able to skip some of the vaccines (and schedule them to every third year instead) but don’t skip on the exam! Keep the litter box clean: This might sound simple, daily and frequent cleaning of the box is a must. Not only will this alert you to life-threatening emergencies like feline urethral obstructions, but it’ll make you aware if your cat is urinating more or less than usual — and help you pick up medical problems sooner! Ask for your veterinary help as soon as you notice any clinical signs – not months after your cat has been urinating and drinking excessively! When it comes to your cat’s health, make sure you’re aware of these common silent killers. The sooner you notice the signs, the sooner your vet can do some blood work and diagnose the medical problem. The sooner it is diagnosed, the sooner they can treat it! If you have any questions or concerns as regards excessive thirst in cats, you should always call or visit your veterinarian — they are your best resource to ensure the health and well-being of your pets.